Definitely one of the better “science” fiction books I’ve read, simply because the science in this book seems viable and not too far fetched. The book is written mostly in journal entries, which upholds the bleak tone of the author while keeping the reader engaged. This book has no romance, little to no self-reflection and reminiscing, and is pretty much all about one astronaut’s will to survive. It skips the cliche ending with reunions between family members and astronauts, and simply focuses on the intellect that a team of astronauts shows in dire situations. 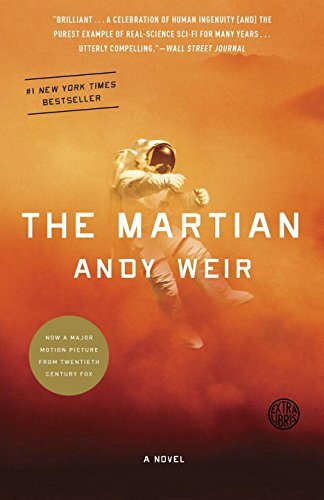 Mark Watney was one man of a crew of astronauts that were supposed to land on Mars, but after a large antenna fell on him during a dust storm and separated him from the rest of his team, they were forced to assume he was dead and leave him behind. Several weeks later, Mark has built his own potato farm, and is living in his team’s base with enough food to last him a year, but not more. He figures out how to contact Earth and manages to get their help on how to live long enough until the next ship comes to Mars in four years. But when one attempt after another fails to get Mark the supplies he needs, time is running out and he doesn’t have any option except to make the most treacherous journey of all: a 3200 kilometer trek to the location of the next Mars landing site. If you enjoyed reading this book review, be sure to hit the “like” button and check out my other book reviews. Over 250 to choose from! It really is an amazing book. Suspenseful, but nothing clichéd. He wasn’t one of the first though. His mission was Ares 3, part of the third Martian voyage. I’m forgetting the exact numbers but there were a ton of people on Mars before him. I used the term “first” a little loosely because there were only two missions of about 5 people each before Ares 3, so I found it appropriate. Thanks so much for the feedback though and for taking the time to read the post! I watched the movie first, and later when I realized it was based on a book, I read it, too. Really love the writing and the science behind it, and sort of gives the message that you can survive no matter the circumstances if you have the will. The movie, for once, doesn’t destroy the book.